A complex eye condition that damages the optic nerve over time, Glaucoma can reduce peripheral vision and lead to blindness if untreated. The disease, which affects 3 million Americans, is characterized by elevated pressure within the eye (known as intraocular pressure or IOP). For decades the only way to control glaucoma and lower IOP levels has been medication, such as prescription eye drops, or surgery—depending on the type of glaucoma and how severe it is. So when studies conducted in the 1970s showed that smoking marijuana appeared to lower the IOP of people with glaucoma, hopes were . . . high. The results prompted the National Eye Institute, a division of the National Institutes of Health, to fund research examining whether marijuana or its active ingredient, the compound known as THC, could be safely used to keep IOP lowered. They concurred that when subjects smoke marijuana or take a form of THC as a pill or by injection, it does lower IOP. But only for a short period—three to four hours. And that’s a major drawback. Other than its mood-altering effect, marijuana comes with some other documented side effects—one of which is especially concerning to glaucoma patients. The drug can cause tachycardia (an abnormally high heart rate) and decreased blood pressure, which can reduce blood flow to an already compromised optic nerve—effectively canceling out the benefit of the lowered IOP. What about THC eye drops? They’ve been tried, but THC can’t be administered in a water-based drop. One study used an oil-based delivery method, but there were two strikes against that—it didn’t result in an IOP-lowering effect, and it caused significant eye irritation. Glaucoma aside now that recreational marijuana is legal in 10 states and medical marijuana is legal in 33—and the clinical benefits of cannabis for certain conditions is well-documented—a recent report has pushed for more research. In 2017, the National Academies of Sciences, Engineering, and Medicine published a report titled “The Health Effects of Cannabis and Cannabinoids: The Current State of Evidence and Recommendations for Research.” It summed up the research supporting cannabis’ many therapeutic uses, its negative effects, and areas where additional research is necessary. 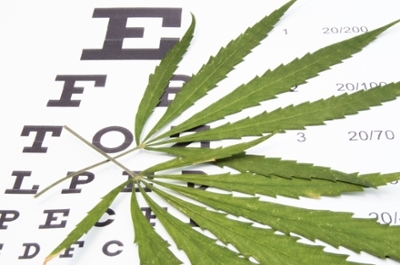 For now, it looks like glaucoma patients should continue to follow the doctor’s orders.